By agreeing to become member states of the United Nations (UN), states have accepted the legitimacy and authority of the International Court of Justice (ICJ). 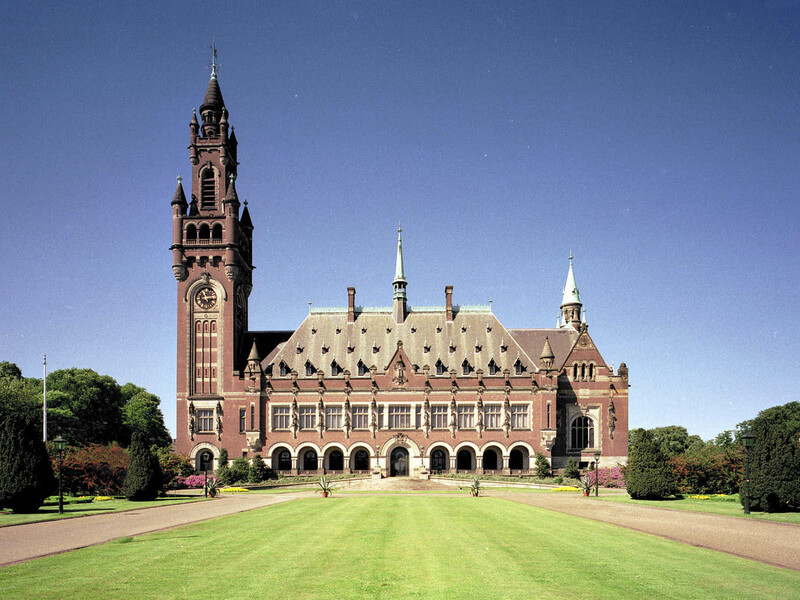 Chapter XIV of the UN Charter establishes the ICJ, as the “principal judicial organ of the United Nations”. In fact, article 92 requires all members of the UN to comply with the decisions of any case to which they are a party. Also, article 36 of the ICJ Statute states that the court has jurisdiction by special agreement or when member states agree to it. Additionally, article 2(3) of the UN Charter, requires all members to settle international disputes by peaceful means. In Latin America, most states have even gone a step further and have agreed to the jurisdiction of the ICJ via the Pact of Bogotá (April 30, 1948), agreeing that Latin American states should settle any disputes peacefully through the ICJ. In theory, this seems to be a fair structure: a State agrees to be part of the UN, and therefore agrees to adhere to its Charter, which recognizes the ICJ as its highest judicial order. However, in practice, some states who were either unsuccessful or in disagreement with the ICJ’s decision in their case have rejected the ICJ’s ruling, questioned its legitimacy, or have gone as far as withdrawn from the ICJ’s jurisdiction. On January 18, 1985, the U.S. informed the ICJ that it had withdrawn from the proceedings of Nicaragua v US, arguing that the “the Court lack[ed] jurisdiction and competence.” In 1986, the ICJ entered its decision on this case and found the U.S. in violation of international law, stating that the U.S. was “in breach of its obligations under customary international law not to use force against another State.” The U.S. contested ICJ jurisdiction, claiming that the ICJ could not hear cases arising under multi-lateral treaties, and finally U.S. withdrew its consent to the Court’s compulsory jurisdiction. On December 6, 2001, Nicaragua filed an application to introduce proceedings before the ICJ in order to determine whether Nicaragua or Colombia had sovereignty over a number of islands in the San Andrés Archipelago (Western Caribbean) and to determine the maritime boundaries between Colombia’s and Nicaragua’s continental shelf. This dispute goes back to the early 19th century, when Latin American states were fighting for their independence from Spain. On December 13, 2007, the ICJ delivered its opinion and concluded that the court had jurisdiction, under article XXXI of the Pact of Bogotá, and ruled that a group of the disputed islands belonged to Colombia, but extended Nicaragua’s maritime limits. Nicaraguan President, Daniel Ortega, gratefully stated, “The court has given to Nicaragua what belonged to us: thousands of kilometers of natural resources”. Meanwhile Colombian President Juan Manuel Santos openly rejected the ICJ’s judgment and stated that the ruling “cannot be implemented” claiming that new international borders can only be established by bilateral agreements. Finally, President Santos decided to take extreme measures and announced that he was pulling Colombia out of the Pact of Bogotá, renouncing its membership on November 27, 2012. On January, 27, 2014, the ICJ issued its judgment regarding the maritime dispute between Peru and Chile, which dates back from the Pacific War of (1879-1883). 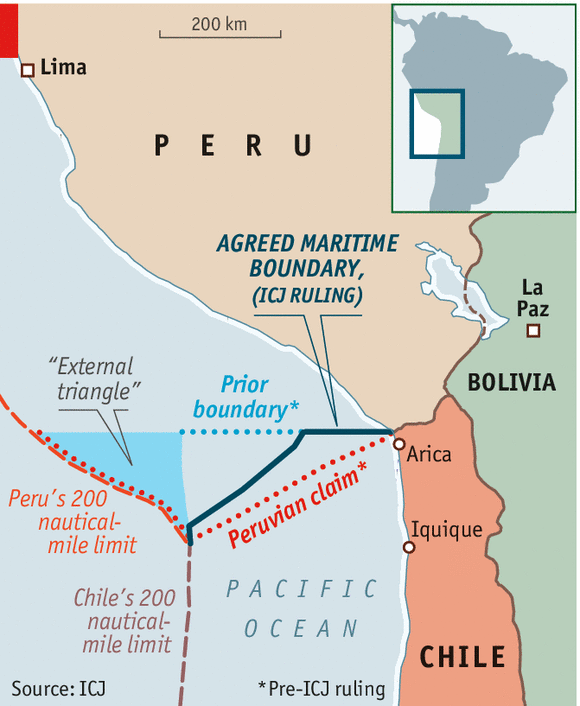 The ICJ decided that a maritime boundary already existed between Peru and Chile, and created a new method not offered by either party to create the demarcation. The ICJ created a starting point (Marker 1) and a parallel maritime boundary line that extended 80 nautical miles (Point A), and then extended the boundary to 200 nautical miles (Point B), then dropped down the border at a Point C, where the maritime boundary would end for both states. Because the ICJ did not use the solutions proposed by either Peru or Chile, the judgment was received with nationalist reactions by both states. Former Chilean President, Sebastián Piñera said he “profoundly disagree[d] with the decision…and the economic loss of an area of between 20,000 and 22,000 km2 in favor of Peru.”, while the current President, Michelle Bachelet, stated this was a “grievous loss.” Peruvian President Ollanta Humala stated “the country will benefit from the exploitation of one of the richest marine areas in the world”. However, unlike in the Nicaragua-Colombia conflict, both states have agreed to implement the ICJ’s ruling gradually. A more controversial case is Bolivia v. Chile, which is currently pending before the ICJ. Bolivia hopes to reclaim coastal access to the Pacific Ocean that it had lost after the Pacific War. 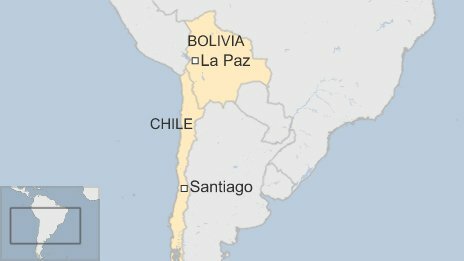 Bolivia is requesting the ICJ to compel Chile to negotiate, in good faith, an agreement that would grant Bolivia access to the Pacific Ocean. Bolivian President Evo Morales Ayma speech delivered on March 23, 2013 stated: “The sea we are claiming as a matter of justice is a sea for the people […] a sea for the Great Fatherland; the Bolivian people shall never renounce the sea, Bolivia shall never be at peace so long as the maritime issue remains unresolved, because giving a solution to this kind of issues is a part of integration”. In fact, Chilean President Bachelet stated on national television that Chile will contest the ICJ jurisdiction in this case. This is despite the fact that Chile had already accepted the ICJ’s judgment in the Peru v. Chile case. It is reasonable and understandable for a State to defend its sovereignty; this is in fact a well-known principle of international law, which supports the idea that a State has the ability to exercise control over its land and people. However, it is important to remember that International Law is based on consent and, importantly, good faith (pacta sunt servanda). If States agree to be bound by an agreement or treaty, it is central that they actually follow through and act according to what they have already agreed. The UN Charter and the Pact of Bogotá have acquired legitimacy because parties have voluntarily accepted them and agreed to act based on them. The ICJ was created to help states peacefully resolve their conflicts and states agreed to be bound by the ICJ’s decisions. So, it is vital that countries who agreed to be bound by an agreement or treaty, act according to the principle of pacta sunt servanda (“agreements must be kept”). After all, international law has been created from the free will of states as expressed in conventions or by usages generally accepted as laws (i.e. customary international law). Withdrawing participation from the ICJ in these types of situations gives the impression of adopting a sore-loser attitude – if a country cannot win before the ICJ, then they will stop participating. When this happens, it chips away at the legitimacy of the ICJ and stops international law from advancing. Maya Zegarra is a third-year student at the University of Baltimore School of Law, planning to graduate in May 2015 with a concentration in International Law. She has a Sociology degree, and is fluent in Spanish, German, English and French. Maya grew up in Peru and attended a German high school, where she participated in a student exchanged program and lived in the Baden-Württemberg area in Germany for four months. During the summer after her first year of law school, Maya studied abroad in France, where she focused on French Law, European Union Law, and Comparative Fundamental Rights. While in France, she interned with an international and criminal defense attorney. Most recently, she participated in the Annual International Humanitarian Law Seminar, hosted by University of Virginia Law, in March 2014. Her primary interests are international law and international humanitarian law. Through her internships Maya has worked on cases related to asylum, refugee, and immigration law. In addition to being a Fellow at the Center for International and Comparative Law, Maya currently serves as the Publications Editor for the Journal of International Law, President of the Latin American Law Student Association, Vice-President of International Law Society, Treasurer of the Immigration Law Association, and 3L Representative of the University of Baltimore Students for the Public Interest. Maya is also a Maryland Rule 16 Student Attorney at the Immigrant Rights Clinic. Military and Paramilitary Activities in and Against Nicaragua (Nicar. 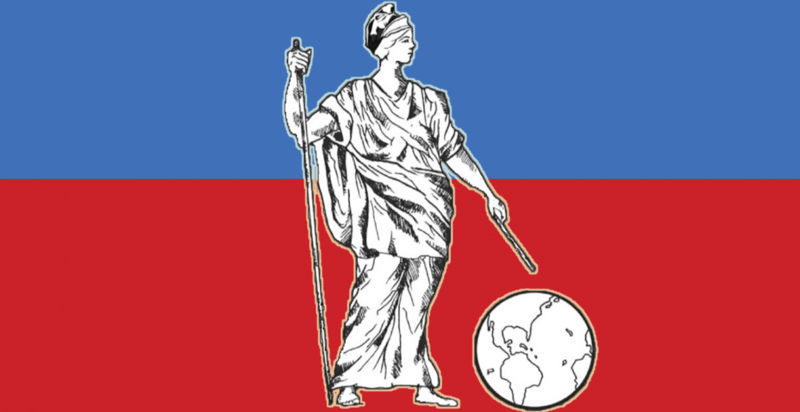 v. U.S.), 1986 I.C.J. 14 (June 27). American Treaty on Pacific Settle “Pact of Bogotá”, Apr. 30, 1948, 449 U.N.T.S. 30. 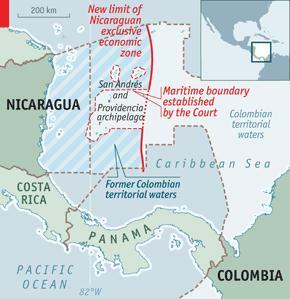 UN ruling gives Colombia isles but Nicaragua more sea, BBC (Nov. 19, 2012), http://www.bbc.com/news/world-latin-america-20391180. Peru v. Chile, 2014 I.C.J. 137 (Jan. 27). Minister of Foreign Affairs of Bolivia, The book of the Sea 6 (Strategic Management For Maritime Vindication Edition, 2nd rev. ed. 2014). Bachelet: Chile will challenge ICJ jurisdiction in Bolivia case, The Santiago Times (Jul. 8, 2014), http://santiagotimes.cl/bachelet-chile-will-challenge-icj-jurisdiction-bolivia-case/. Categories: international law | Tags: Bolivia, Chile, ICJ, ICJ Statute, International Court of Justice, international law, Legitimacy, Nicaragua, Peace Palace, peaceful dispute settlement, Peru, The Hague, UN Charter, United States | Permalink.